Today. On the cold, hard concrete floor of the garage. 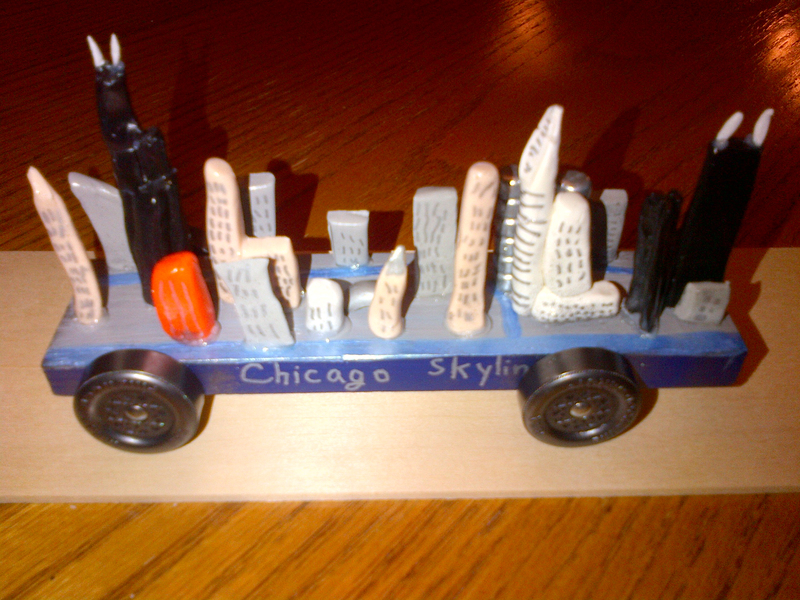 My 10-year-old’s vision of the Chicago skyline, wrought from Sculpey and paint and glue with a to-scale level of skill and craftsmanship and hard work as that of the architects and engineers and steel workers who erected the full-sized Windy City skyline. Broken — the beautiful thing shattered like glass. My folly was thinking it needed just one more layer of clear coat varnish. My folly was holding it gingerly between my fingers and not firmly grabbing it by its wooden base. My folly was my hubris in thinking I knew best what his car needed. And that my age and experience relative to his were enough to prevent harm from coming to his craft. I was wrong. But by God‘s good grace, kids are resilient and kids are forgiving. My son calmed himself and listened to my apologies, listened to my pledge to help him repair it, and listened to my assurances that we could make it look as good as it had when he’d put the finishing touches on it only the night before. Tonight, the car gets checked in. Tomorrow, it will glide downhill at up to 350 (scale) miles per hour. It might win. It might lose. And it might fall off the track and shatter. But having experienced the tragic and having recovered from it together, I know for my son and me that whatever happens tomorrow, everything will be o.k. UPDATE Jan. 30, 2013: My son raced the car, and clocked speeds at more than 216 miles per hour, against winning cars that sped downhill at almost 230 m.p.h.! He stayed on the track, and while a couple antennae broke again (the car’s Achilles’ heel) in the racing, it didn’t shatter on race day as it did for me. While others’ bested his cityscape for speed, he just learned at last night’s pack meeting that he won Best Design honors — and he’s elated! He’s also entered the design in a national Dremel-Lowes pinewood derby design competition first featured in a previous pinewood derby-themed blog posting. If you want to cast your vote for his car, visit the site and click on the View Entries tab; scroll down until you see his Chicago Skyline car, then select “10” (how else would you vote?!) and then click the “Save Feedback Vote” button at the bottom of the page. Thanks much for all of your support! ~ by Random Handyman on January 25, 2013. Thanks for the link — and for your interest in pinewood derby~!